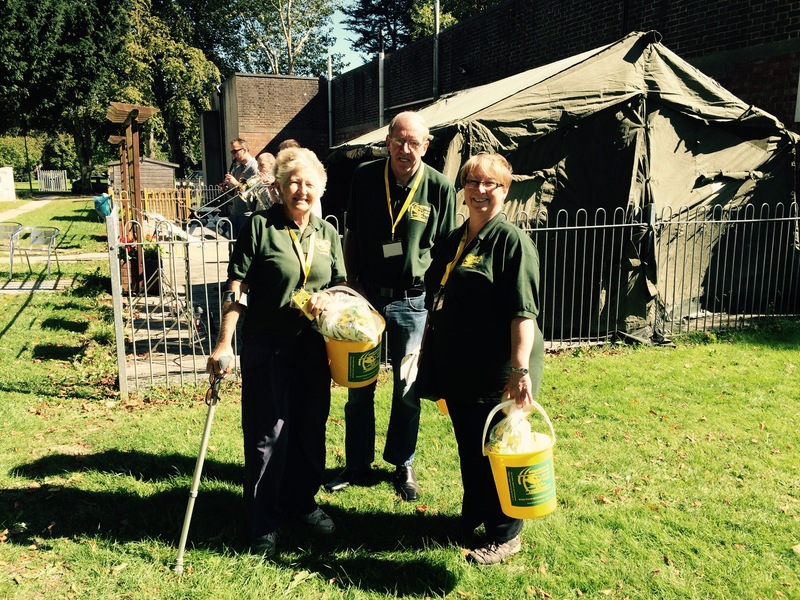 Our volunteers are the backbone of our Charity. We are always looking for people to join our volunteer team. From attending events, to collecting donation pots and giving talks, whatever your talent or interest, we can find a role to interest you. Here some of our volunteers tell their stories. I have been a volunteer at Hampshire and Isle of Wight Air Ambulance for 3 years. I work shifts and so I have spare time during the week and collecting donation pots is ideal for me. The office will email me and ask if I am able to collect a pot and give me the address and details of the person, and in the case of a local business, the opening hours. Most of the time they are collections from places that are within a few miles of my house and I can do them at a time that’s convenient for me. I love the variety of places I go to; I have collected pots from people who wish to donate but are unable to get out and about, people who run community groups that collect on our behalf, pubs, shops and bakeries (it’s always rude not to buy a doughnut while I am there). One of my favourite places to collect from is Driver Awareness Training (when you have been caught speeding and have to go on a course) as the people are so incredibly generous. I try to arrive during their break time so as not to disturb them, but this means I often get to talk to people about the important work of the Air Ambulance, and why they should slow down a little! I then take it into the Charity office where it gets counted by wonderful Volunteers every Monday. Sometimes a collection pot can have £5 in coppers in it, sometimes it can have £80 in notes. Donations are important no matter how much or how little. I have been a solicitor for 20 years and my area of work has made me aware of HIOWAA and the service they provide. I have supported HIOWAA financially for a long time but the service the Critical Care Team provide came a little closer to home when my nephew was in need. He had been knocked down on a road in Winchester and upon 999 being called, the Air Ambulance had been dispatched. I knew that this wasn’t a good sign due to my role at work. My nephew was stabilised at the scene and was taken by road to Southampton General Hospital after suffering facial fractures and a mild head injury. Volunteering remains my way of giving back. The service came to my family’s assistance and I want to ensure that it is there for others when it is needed. Raising funds is vital for this invaluable service, even more so now that night flying has been introduced. I find it a really positive experience. I get to meet different individuals and groups I would not ordinarily come into contact with. Volunteering with HIOWAA is really fulfilling. 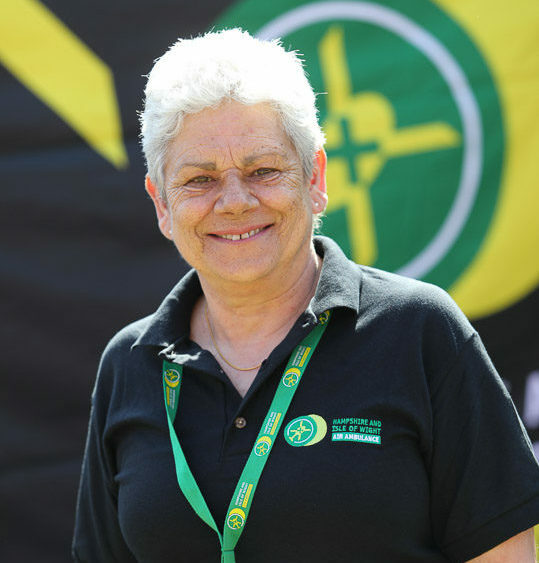 ‘Life can change in a day, give a day to change a life’ – the HIOWAA volunteer slogan, and the reason I became a volunteer. In June 2008, our lives changed forever. We received the news that nobody wants to hear. Dad had been involved in an explosion at work whilst renovating a yacht and we had to get to the hospital, and fast. The hospital said that Dad had a 50/50 chance of survival, having sustained 40% burns and having breathed in fire repellent expanding foam. Despite the odds, over twenty operations and numerous hours of rehabilitation, four months after being admitted, Dad finally came home. 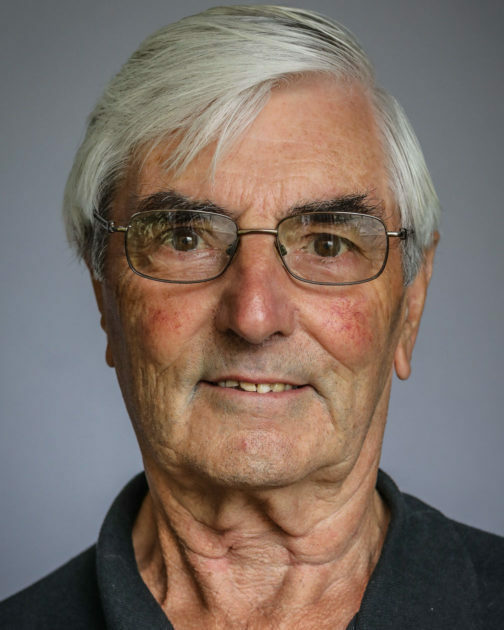 However, had it not been for the specialist care that the Air Ambulance gave him at the scene, he would never have survived the journey from Hythe Marina to Salisbury District Hospital, something our family will be forever grateful for. Even more so as, at the time, the helicopter had only been flying for six months. My friends and family would describe me as determined and a bit of a perfectionist. I am my own worst enemy, as I always think I could have done better and I love being busy. On the rare occasion that I have a day with absolutely no plans, I sit on the sofa for about ten minutes and think about all the things I could or should be doing – and normally get up and find something to do! So volunteering for a charity works perfectly for me. I work a typical 9-5 day, organising home and motor insurance for high net worth individuals (certainly a world away from my own) and, whilst my partner is busy juggling work as a builder, I need something to keep me occupied at weekends. So, when Dad saw an article in the local paper about volunteering for HIOWAA, we thought it would be a great way to give something back whilst working together on something, a kind of ‘father-daughter’ thing. Five years on, and not only do I still volunteer, but Dad has made the transformation from volunteer to HIOWAA employee. It’s an organisation that has not only saved Dad’s life, but has helped him to rebuild it too. 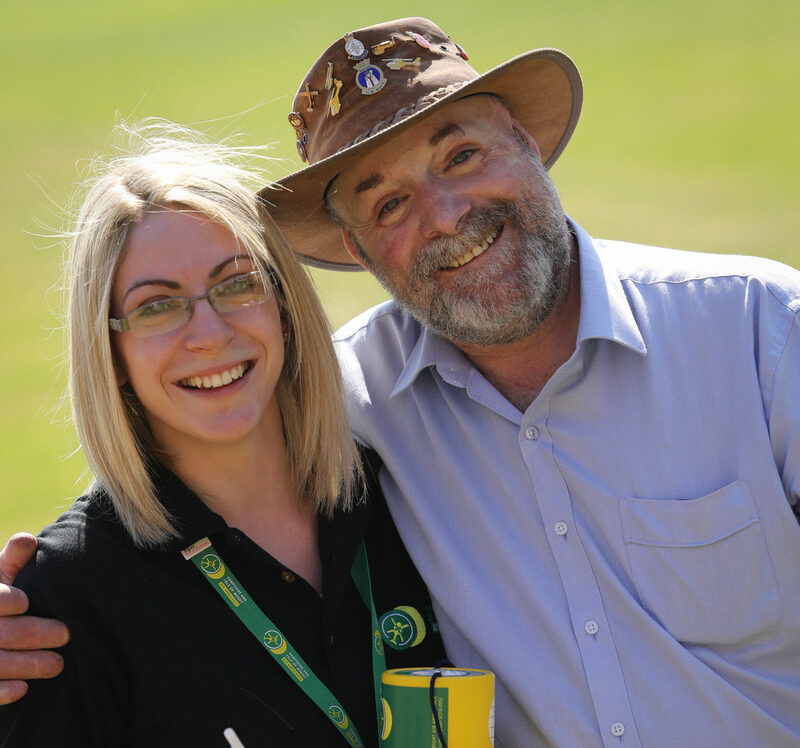 You become a part of ‘the family’ when you become a HIOWAA volunteer. It really doesn’t matter what you have going on in your life, whatever time you can give, no matter how small, they are always grateful. During my time with the charity I have passed three insurance exams and am currently studying for a fourth, I play netball once a week for a local league team and I’ve bought and undertaken a huge house renovation. Through all this, the charity staff have taken a keen interest and have appreciated that I can only volunteer a few times a year. Not only are they flexible, but there is so much variety to what you can do to help. 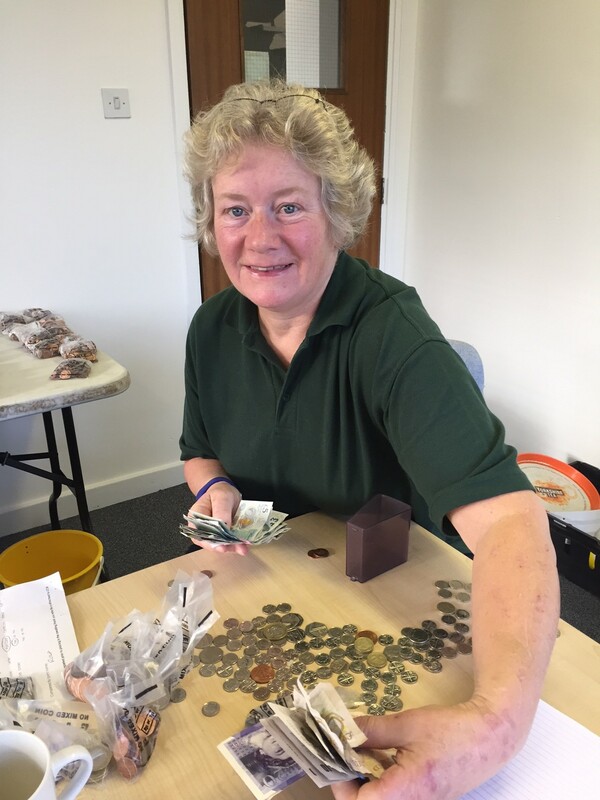 I like volunteering at weekend events as I have so many different experiences, but I also run the eBay account and help sort and sell used postage stamps – something I can do whilst sitting in front of the TV in the evenings. Whatever skills you have, the charity will get the best out of you. Life is short; do stuff that matters. When I became a volunteer for HIOWAA in 2012, I was asked if I would consider giving talks on behalf of the Charity. “No way” was my firm reply, having avoided public speaking of any description throughout my 40 year career. Four weeks later, at short notice, I was asked to visit a golf club to collect a cheque on behalf of their Veterans Group. Later that day, I collected the cheque and was then asked to give a 20 min talk. Thanks to the excellent induction I had received from the Charity I went straight into it with no preparation, or time to worry, and the rest is history. I’ve been giving talks to groups ever since. The arrangements are made by the office but I always make contact about a week ahead to check on access time, parking, availability of projection screen etc. I also get a feel for possible numbers attending. I use the Power Point slides provided by HIOWAA as they provide prompts as you go along, although I suspect that no two talks are ever quite the same. 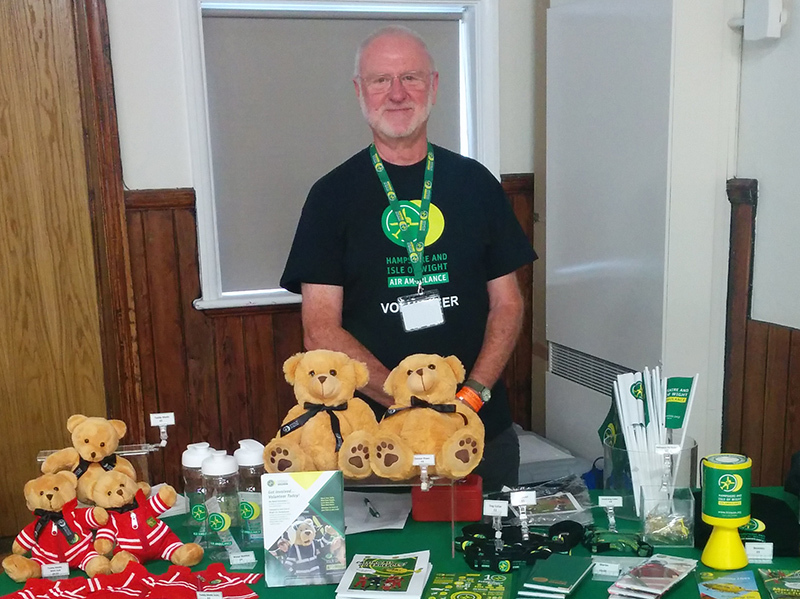 I find most groups are keen to hear about our operations and the development of the Charity, which makes it very easy to establish a connection with the audience. When the talk is over, I also set up a table with Charity merchandise to sell, and this is often the most hectic time as it’s then that individuals ask the questions that they don’t want to ask in front of everyone else. All in all, every presentation is different, but I find people are generally are very appreciative of what we do and how we do it, and will hopefully become regular supporters in some way or other. I love meeting and talking to as many people as I can about the vital role of the Air Ambulance. I meet people from all walks of life and sometimes I meet some right characters! Being a volunteer gives me the opportunity to attend events and festivals which I would normally never have considered going to. When I first got involved, I thought my role would be fairly limited, but being a volunteer has got me involved in many different ways, from towing the Air Ambulance Pod to events to helping out at the office, wearing the Charity mascots, giving talks to local clubs or getting involved in the Charity’s Be a 999 Hero education programme. I volunteer at events on most weekends throughout the summer. Volunteers can give as little or as much of their time as they like, but once you have done one event, trust me, you will want to do more, as you are volunteering with other like-minded, fantastic volunteers. When I started I thought I would do one event a month – last year I did approximately 50 events! I have also become a Lead Volunteer for events during the summer. The great thing is that I’m not on my own when leading an event, because if I have a problem, help is only a phone call away. Helping this very special Charity has really enhanced and enriched my life and I am extremely proud and honoured to be a part of the HIOWAA family. If you feel you could spare some time, volunteer today! I promise that you will not regret it for one moment. 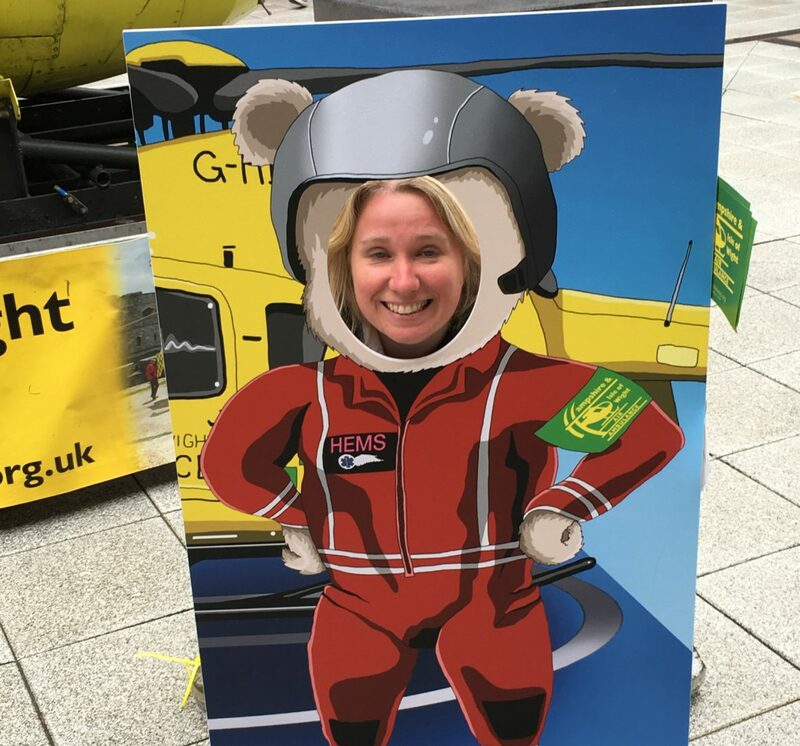 When I first started volunteering for HIOWAA I attended events around the county to promote the Charity; selling merchandise, collecting donations and talking to members of the public. When the Charity moved to new offices, I could see that there were plenty of opportunities to assist with a variety of tasks in the office, including restocking the merchandise boxes when they returned from weekend events. The Schools and Youth Coordinator was embarking on the preparation of a new educational programme, aimed at secondary school age children. I offered to produce a contact spreadsheet of all the secondary schools in the area, and I worked on this at home and in the offices and thoroughly enjoyed feeling part of the Team. I’ve also helped to prepare a contact spreadsheet of all the athletic clubs in our area in preparation for the launch of the Charity Southampton Airport Run in June. I thoroughly enjoy being around the office because I’ve got to know all the staff, which gives me a better understanding of the Charity, and how the behind the scenes organisation ultimately keeps the Air Ambulance and its team flying and saving lives. I am always made welcome and have fun joining in the office ‘banter’. Attending events and being part of the education programme gives me the opportunity to spread the word about the life-saving work of the Charity. To hear the positive feedback from members of the public is so rewarding, I sincerely feel that I can contribute to make a difference. I have been a volunteer for two years now and it’s great. At my induction I was asked ‘why us?’ I replied that I wanted to do some volunteer work and the Air Ambulance came out on top. I hope never to need it, but if I did, I would be grateful that it was available. It has become my way of doing something good and putting something back. My main role is helping to raise funds with a collection bucket at events such as the “British Touring Cars” or the “British Super Bikes” at Thruxton Race Track. This year I also helped out at the “Truck Racing” day. I like the Thruxton days as I always hear from members of public who we have helped. It is also great to get involved with the charity pod; a recreation of our old helicopter that we take to events. The look on children’s faces when they sit in the pilot’s seat is reward in itself. And it’s even better when the parents pop some cash into the bucket! When you volunteer for HIOWAA there is no pressure to do things; you can do as little or as much as you want. One of the things I hear most when people donate is; “you are doing a great job, please keep it up”. So if you want to meet lots of interesting people, HIOWAA is the place to be! Volunteering for HIOWAA has been fantastic for us as a young family. 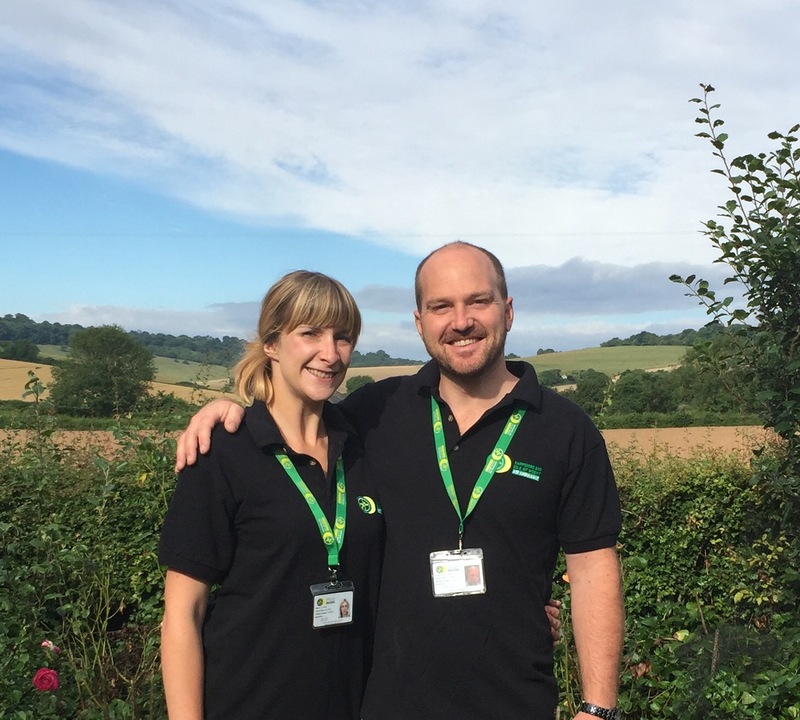 We volunteer at all sorts of events, from village fetes to larger shows and festivals, and we’ve been able to fit it around a busy family life. Living close to Thruxton Circuit we often see the Air Ambulance flying to and from the airbase, which really helps to remind us why we need to do our bit to help keep the Air Ambulance flying and saving lives. We both enjoy talking to the public and telling them all about the charity; people are always so interested to learn about us. At the end of an event it’s a great feeling knowing that we’ve helped to spread the word about this vital service.